It’s been a very busy month on the PMI front. Firstly, we held the National conference in the Aviva on the 26th April. It was a sell-out event with some great speakers. The topic was all around making change happen with the tag line of ‘The Change Makers’. Next-up, a few of the committee were lucky enough to attend the the PMI Leadership Institute Meeting (known as the LIM). This is held along with the PMI Congress. This year, it ... See More was held in Berlin from the 4-11 May. The Big news coming out of this event is that both the LIM and Congress will be held in Dublin in Mid-May 2019. This is great news the Ireland Chapter, for Dublin and Ireland. It will have been 8 years since it was last held in Ireland so we’re all very excited about it coming back! In upcoming episodes of this podcast, we’ll be sharing insights that were captured from the LIM where we were delighted to talk with one of the 5 founders of the PMI, Jim Snyder. We also interviewed the current CEO of PMI, Mark Langley, other members of the PMI board and over 20 presidents and members from chapters all over the world. All this great content will be shared in upcoming episodes of this podcast. Back to this month’s show. I brought the mic to the Aviva on the 26th April and talked with many of the committee, speakers and attendees on the day. I was very interested to capture what their thoughts were on making change happen in their projects and how to successfully make it stick. You’re about to hear a great variety of responses which I’m sure you’ll enjoy. 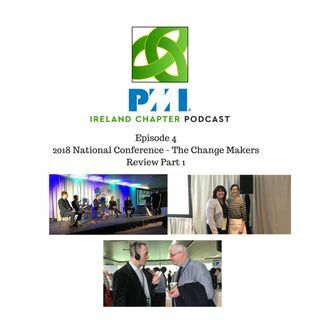 Before we go into that, please be sure to help us spread the world about the Ireland Chapter of PMI Podcast. Share it on the socials, tell another PM, listen to it in your team meeting, and, most of all, be sure to get in touch with feedback. Do you find it of value? What else can we add or cover to make it more useful to you? Would you be willing to share you own Project or Programme story, lessons learned and successes? We’d love to hear from you! Ok, for now, enjoy the first part of the National conference round of. Part two next month with lots more from speakers like Gerard Fleming, Anton Savage, and other attendees from the event.